President Reuven Rivlin addresses Conference of Presidents, says Israel should not become a divisive topic in this American election season. President Reuven Rivlin on Thursday addressed the delegates of the 42nd annual Conference of Presidents’ Leadership Mission to Israel, and said that Israel should not become a divisive topic in this American election season. 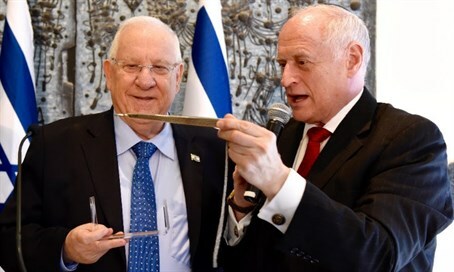 “Support for Israel has never been and must not become a partisan issue,” Rivlin told the delegation. The President said that the real problem is with extremists who believe that incitement brings them power. The delegates of the Conference of the Presidents have been busy during the visit to the region, meeting with Turkish President Recep Tayyip Erdogan and with Egyptian President Abdel Fattah Al-Sisi. The meeting with Al-Sisi was particularly “eye opening” for the delegates, as Stephen M. Greenberg, chairman of the Conference of Presidents, told Arutz Sheva this week. Prime Minister Binyamin Netanyahu also addressed the visiting Jewish American leaders, blasting the UN’s bias against Israel while also praising Israel’s relations with other countries - and especially Arab countries which are beginning to understand that Israel isn’t their enemy.